Your home puts its best face forward in the living room. 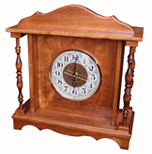 That's why Amish Furniture Factory has a selection of every kind of living room furniture you can imagine. From comfort seating to display and storage, your entire living room can entertain in heirloom quality. Quality construction not only improves the beauty of your living room, it also ensures reasonable longevity for your furniture. 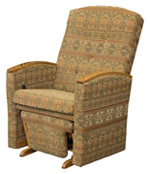 When conventional manufacturers make living room furniture, the pieces that fall apart the quickest are the various types of living room chairs: sofas, loveseats, recliners, rockers and gliders. These are the furniture you live on, and their frequent use includes weight loads and multi-directional weight shifting. 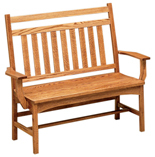 In contrast, Amish furniture shops consider the heavy stresses that living room seating will go through, and mitigate the pressure by building with Old World construction methods in solid wood. Not only are the pieces that make up Amish furniture glued and nailed, but they are shaped in ways that allow them to lock together tightly before being glued or nailed. These joints are known as dado joints, mortise and tenon joints. While hardwood seating has durable joints, upholstery adds comfort and design to your living room. Amish Furniture Factory has a vast assortment of upholstery in leather, faux leather, fabric, and recycled eco-cotton. Besides plush seating, the sensory experience of a living room includes entertaining with tea and beverages. Our selection of coffee tables, sofa servers and cabinets keep your guests' drinks within easy reach so you can focus on each other. You may also match tables easily by browsing occasional table sets which include a coffee table, end table, and sofa table. To put the finishing touches on your living room, accessorize with handcrafted clocks, calendar frames, and suspended shelves. Whether entertaining guests or enjoying a peaceful moment alone, Amish furniture and handcrafted decor can make your living room the heart of your home.